We offer a bright and warm apartment of 100m2 (1076 ft2) for couples. Fully equipped with all the facilities expected of a deluxe apartment. 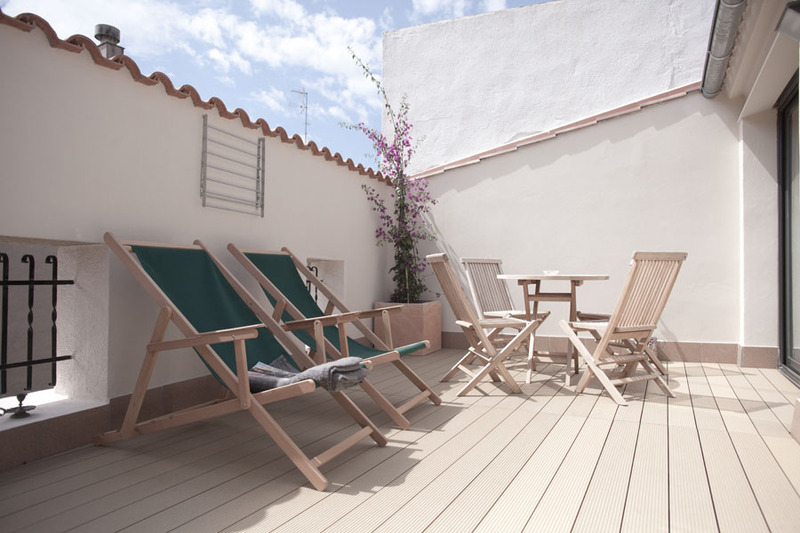 Parellada Apartment is very comfortable and it includes a terrace and a spa in the bathroom area. 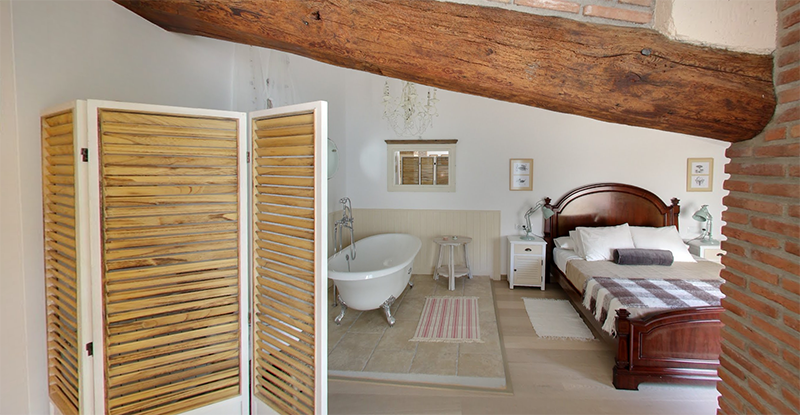 The loft has been harmoniously designed in an English Cottage style and Classic Provence style as well. It has ancient pieces of furniture that have been restored so they turn out to be very romantic. Its bright colors they give a tender feeling of relaxation and peace. This decoration contrasts with the modern spa, which is functional and minimalist space. This area is spacious and was designed to be a dark and Zen place. Colder elements as the micro cement cover the walls of the spa and the splendid steam bath. On the left wing of the apartment you can find a totally equipped kitchen integrated in the dining room and the living room, offering a maximum comfort. The bedroom has an ancient bathtub of four legs beside the bed. It has towel service and bath products elaborated with wine. You can reach the terrace from the living room. It is a sunny and secluded space with high walls, wooden floor, exterior furniture, deck chairs and a summer shower. On the right wing of the apartment there is the spa. It consists of a spacious shower and an ecological integrated WW washbasin and toilet that favor the exploitation of natural resources. It also has a massage bunk were you can receive wellness treatments and wine therapy treatments. It also includes a steam bath, water therapy and a Scottish jet with adjustable height and temperature. The water area is designed with dark colors and blue LED lights to aid relaxation. The space is used as a relaxing and comfort zone, to detoxify your body and mind. Apart from that, it is equipped with bathrobes and slippers and you will also find a hairdryer, towels and the basic amenities for your hygiene. Parellada Apartment is an ecological apartment thought to exploit the natural resources and preserve the health of the planet. It has solar panels to heat water and all the glass windows are double glazing and have an air chamber. All the electrical appliances have an Eco A label. The Roca WW toilet makes better use of the water and it also has a water softener. The taps are equipped with a water filter. The light bulbs are low energy consumption. Besides, the electric heating has adjustable thermostats. It is not allowed to smoke in the inside but you are allowed to do it on the terrace. We have smoke alarms.